Wisdom of Life. 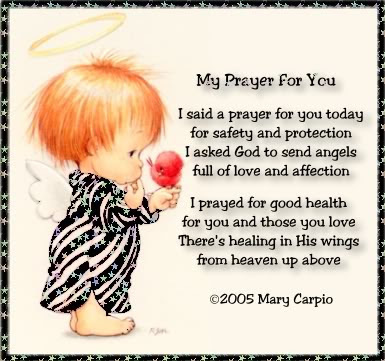 : My prayers for you. I was asked by a friend, what is my religion? I told her my belief is The Universe which represents all the faiths on earth. When i was a kid, my mum taught me Taoism but she allowed me to study bible in a nearby church. In my early twenties, i met a Hindu Guru who guided me Hinduism, particularly on Hanuman. At my thirties, i studied Buddhism in the English version. Ten years ago, i read the beautiful Quran to understand my Muslim friends. I had been to the Chinese and Indian Temples, Mosques and many Churches of many denominations. This friend wanted to know how i prayed. I don't pray for myself, except to pray for others. My belief, in order to be blessed by The Universe i have to earn for them. In the course of my life and my career, i have had helped to save many lives. My tag line is... i rather served than to be served and i love to serve willingly without condition. My rewards are...I am very happy because i have friends of different races, creed and belief, who are thinking good of me and some even pray for me with their whole heart. I strongly believe, when there are so many people who are positively thinking for me, i would gain the hidden force and energy to make my life a happier and healthier one. See to believe, i have a wisdom mind but a much younger heart. Very few people would be able to see my real age. Thanks God. My health is in tip top condition too. I guess i could still make another baby, if little darling is prepared to go along. Most people my age would have retired, whereas i am still enjoying my career and life to the utmost. For all these good things of me, i have to be grateful to all my friends and clients who constantly pray for me all the time. My belief - "The best prayers are those that others think and pray for you because of your good deeds and values."